This aquatint was taken from plate 9 of Salt's 'Twenty Four Views in St. Helena, the Cape, India, Ceylon, the Red Sea, Abyssinia and Egypt'. 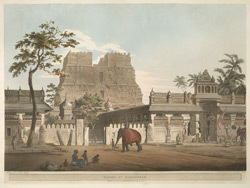 Viscount Valentia, George Annesley described this temple at Rameshvaram (in Tamil Nadu) as: "one of the most sacred and most splendid in the East. It is built on the sea-shore, at the extremity of the peninsula of India ... The entrance to the Pagoda was through a very lofty gateway, I should suppose about one hundred feet high, covered with carved work to the summit. It was pyramidally oblong, and ended in a kind of sarcophagus. The door was about forty feet high, and composed of single stones placed perpendicularly with others crossing over. This massive workmanship reminded me of the ruins of Egyptian architecture."